Four people died in the "horrific" crash after a lorry smashed through a central reservation and collided with several vehicles travelling in the opposite direction. The crash, in south Gloucestershire, happened several miles north of Bristol between junction 15 for Almondsbury and junction 14 for Falfield, just after 2.30pm on Saturday. Avon and Somerset Police said a woman and two children were taken to hospitals in Bristol in life-threatening conditions, while the lorry driver also required treatment. A marine who was travelling to a wedding in Coventry when he saw the lorry nose down in a ditch and a car on its roof, described how he helped pull two children from the wreckage of the crash. Alex Morgan told how on approaching the scene he "could already hear two children screaming and when looking inside they were both in the back suspended upside down from their seat belts. "They were both fully conscious with no initial signs of serious bleeding or injury, so I unclipped the little girl's seatbelt and carried her out as others worked to extinguish the front of the vehicle." He added that he then pulled a young boy from the wreckage and later helped to remove an injured woman from the vehicle. A cardiologist travelling in a car just metres behind also stopped at the scene to help the injured. Amer Hamed said a lorry and "at least" two cars were involved, adding: "One was absolutely destroyed and another had flipped over." Along with other medically trained motorists, Mr Hamed said he helped an injured woman at the scene, while other travellers "were helping as much as they could" and offering food and water. Images on social media showed a lorry which had gone headfirst into a ditch at the side of the motorway, while other images also showed damage to the central reservation. 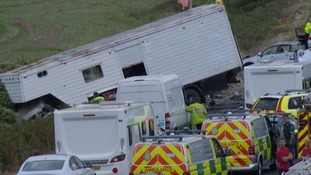 Superintendent Simon Ellis of Avon and Somerset Police described the crash as "horrific". "Emergency service personnel have been working tirelessly at the scene in harrowing conditions and I'd like to praise them for the work they've done and are still doing. Police said the southbound carriageway and two lanes of the northbound carriageway have reopened, but the third lane is expected to remain closed on Monday while investigations continue.